Thermodynamics and information have intricate inter-relations. The justification of the fact that information is physical, is done by inter-linking information and thermodynamics – through Landauer’s principle. 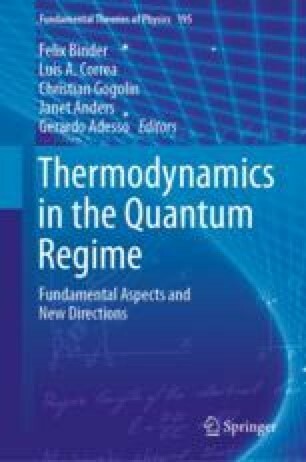 This modern approach towards information recently has improved our understanding of thermodynamics, both in classical and quantum domains. Here we show thermodynamics as a consequence of information conservation. Our approach can be applied to most general situations, where systems and thermal-baths could be quantum, of arbitrary sizes and even could posses inter-system correlations. The approach does not rely on an a priori predetermined temperature associated to a thermal bath, which is not meaningful for finite-size cases. Hence, the thermal-baths and systems are not different, rather both are treated on an equal footing. This results in a “temperature”-independent formulation of thermodynamics. We exploit the fact that, for a fix amount of coarse-grained information, measured by the von Neumann entropy, any system can be transformed to a state that possesses minimal energy, without changing its entropy. This state is known as a completely passive state, which assumes Boltzmann–Gibb’s canonical form with an intrinsic temperature. This leads us to introduce the notions of bound and free energy, which we further use to quantify heat and work respectively. With this guiding principle of information conservation, we develop universal notions of equilibrium, heat and work, Landauer’s principle and also universal fundamental laws of thermodynamics. We show that the maximum efficiency of a quantum engine, equipped with a finite baths, is in general lower than that of an ideal Carnot’s engine. We also introduce a resource theoretic framework for intrinsic-temperature based thermodynamics, within which we address the problem of work extraction and state transformations. We acknowledge financial support from the European Commission (FETPRO QUIC H2020-FETPROACT-2014 No. 641122), the European Research Council (AdG OSYRIS and AdG IRQUAT), the Spanish MINECO (grants no. FIS2008-01236, FISICATEAMO FIS2016-79508-P, FIS2013-40627-P, FIS2016-86681-P, and Severo Ochoa Excellence Grant SEV-2015-0522) with the support of FEDER funds, the Generalitat de Catalunya (grants no. 2017 SGR 1341, and SGR 875 and 966), CERCA Program/Generalitat de Catalunya and Fundació Privada Cellex. MNB also thanks support from the ICFO-MPQ fellowship.